When the United Nations (UN) launched the 17 Sustainable Development Goals, Goonj was starting to rev up its preparations for the upcoming winters especially in north India. One of the targets of the first goal charted out by the UN says- “By 2030, build the resilience of the poor and those in vulnerable situations and reduce their exposure and vulnerability to climate-related extreme events and other economic, social and environmental shocks and disasters.” The fact remains that here we are talking about extreme situations but for millions of homeless people the falling temperature to even 8-10 degrees without adequate clothing is also a struggle for survival.. Anyone can tell you that the three basic needs for survival are ‘food, shelter, and clothing’. Thus clothing is not only about dignity and looking good, it’s a means of survival first..especially in the winters. But somehow we took clothing for granted. We assumed that since all of us have a piece of cloth, there is adequate cloth for all. This is probably why we don’t see winters as a disaster for the poor. Fact is, without adequate clothing, winter is an annual torturous disaster that lasts for months at end. Thus while the world invests in large scale development programs, can we also look at building the resilience of the poor to this annual disaster with some simple pieces of warm clothes. At Goonj, we firmly believe; Cold doesn’t kill people, lack of clothing does. “In winters, when the child cried out, his mother would give him some local liquor and make him sleep. This has been going on for years.. This time the situation is different” Binod Da, from village Parashia, Medinipur, in West Bengal shares candidly, pointing out how reaching out woolens by Goonj made a difference. More than 2 decades ago the seed of Goonj was sown by a shocking story of cold, “When I feel cold, I hug the dead body and sleep. It doesn’t turn around.. It doesn’t bother me”- Kaneez Bano, a 6 year old, living on the roads of Delhi innocently told him. Kaneez’s father made a living by picking up and cremating abandoned dead bodies from the roads. In Khalwa block of Khandwa district, Madhya Pradesh, Sagaun trees (teak, Indian oak) are spread across a large forest area. The villages inside these forests become very cold in the winters. Rajesh from Booti village in this area shares, “During winters we have to water our farms even at night since electricity comes in shifts. It used to be unbearable to stand in knee deep water in such cold. After we were provided the woolens it was such a relief.” These farmers also have to keep a watch all night to prevent thieves and wild animals like wild boars from destroying their crops. As a result they would often fall sick. In Khalwa the nearest market is 40 kms away while the district market is 80 kms away. One would end up paying between Rs 40 to Rs 100 just to reach the markets. The woolens available nearby are of very bad quality and 4 times the price of the block and district markets. The logic is simple – the more remote the area, the higher the cost as the transportation charges are added. Typically villagers would either end up having no woolens or buying woolens on loan. Our Partner organization Spandan shares that in this area winter nights are so cold that people wake up at 3’o clock in the night to light firewood. This is common across most of far flung areas of north India as well. There are many negative side effects of this practice – cutting down of jungles for firewood increases substantially in winters, which decreases the community’s resilience to other disasters. It makes the homes, built close together, more vulnerable to fire accidents. Lastly since people miss out on proper sleep through the night, their work hampers the next day. Now imagine… all this can be avoided with just some appropriate warm clothes!! Through Goonj’s Cloth for Work (CFW) initiative the villagers of Khalwa worked on some of their own community issues and earned very good quality winter kits for their families in exchange. Now the villagers of Booti even carry their warm clothes with them when they travel to the cities for work. In the highest and the coldest parts of Uttarakhand or the far flung parts of Kashmir which face quite intense winters, when we saw the miserable conditions of the people we came up with winter kits; to reach a comprehensive package of warm clothes and Sujni (mats) for the entire family’s needs. Every year thousands of winter kits are reaching out to communities in J&K, Uttarkhand, Bihar, Odisha, West Bengal. Similarly in cities like Delhi we reach out warm clothes through organizations working with the homeless, orphans, children, with night shelters/Rain Baseras etc. 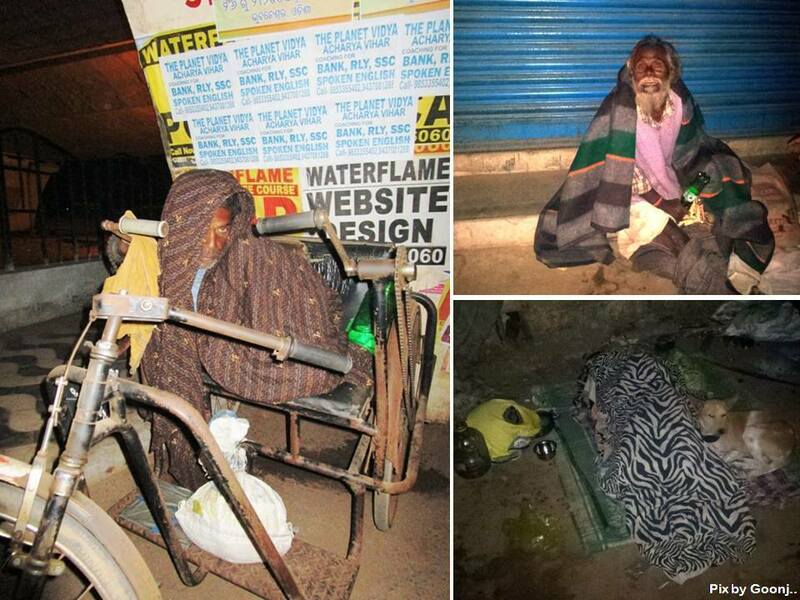 apart from distributing woolens directly on the road sides in winter nights. In winters we run our annual campaign ‘Odha Do Zindgai’, we made ourselves a promise; to reach out at least 10,00,000 woolens across India. It will be possible… because of you and me.. because we will take out the woolens lying unused in the back of our storage closet, or thrown away. Each one of these woolens can break the cycle of struggle for someone and build a resource for him/her for many years to come. The warmth that we cherish and enjoy in winters, whether it’s the early morning warmth of a quilt or the tugging to a cozy sweater or a shawl.. the feeling can only be felt .. No words can adequately describe it.. When you give your woolen/shawl or a blanket to keep another warm, it’s this sharing of a common humane feeling which you pass on as a gift of life. WE can’t think of a more beautiful, more meaningful, more life giving gift.